War of the Spark preview season has begun! Zombies are invading Ravnica! Planeswalkers are fighting for their lives! Liliana has betrayed Nicol Bolas! The War of the Spark trailer whet the appetites of new and enfranchised players alike, and hype for the set is at unprecedented levels. But, of course, we aren’t just excited about the story of War of the Spark: we can’t wait to play with new cards! Magic players were especially keen to see what the 36 new Planeswalker cards would look like – and, as of this writing, we already have some answers. In case you missed it, here are some new and notable Planeswalker cards we’ll be seeing in War of the Spark. Printing 36 Planeswalkers in one set is no mean feat – and as some fans suspected, they wouldn’t all fit in the mythic rare slot. For the first time since the debut of the Lorwyn Five, we’ll see Planeswalkers at rare and uncommon instead of mythic. It might seem odd to see Planeswalkers at such low rarities – in many ways, they’ve become synonymous with mythic rarity itself. But, like the uncommon legendary creatures in Dominaria, the lower-rarity Planeswalkers have an appropriate power level. They feel powerful, particularly in Limited, but not game-breaking for Constructed play. 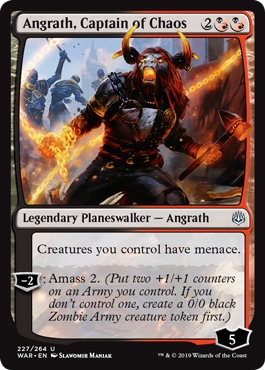 So far, it appears that uncommon Planeswalkers will have one activated ability that removes loyalty counters, but they’ll have a high starting loyalty relative to their mana costs. Rare Planeswalkers will have two abilities (one that adds loyalty and one that removes it), and mythic rare Planeswalkers shouldn’t deviate too much from the model we’re used to. Additionally, all the new Planeswalkers we’ve seen from War of the Spark have static abilities. These global effects – similar to those of artifacts and enchantments – make each Planeswalker a more potent threat, and some may win you the game outright. For example, Angrath’s ability to grant menace may be just what you need to break through a stalemate – and he’s only an uncommon! Speaking of uncommon Planeswalkers, let’s take a look at some of the new characters we’ll meet in War of the Spark. Magic lore experts may be familiar with Teyo Verada, who was introduced at this year’s Emerald City Comic Con panel. Teyo is a young Planeswalker on his first interplanar journey, and he’s still learning how to protect his home plane from diamondstorms. He might find a home in an Arcades, the Strategist deck, but we imagine it’ll be some time before Teyo reaches his full potential. Like Teyo, Davriel is a new character in Magic lore making his first appearance on cardboard in War of the Spark. His abilities are both appropriate for his character (who steals spells from other mages) and a call-back to Shrieking Affliction from Return to Ravnica. Discard-focused decks can be a hard sell in Standard, but we’ll see what Davriel can do in non-rotating formats. No one seems to know who The Wanderer is, but that hasn’t stopped fans from guessing. Is it Elspeth, returned from Theros? A member of the Umezawa family seeking revenge on Bolas? She doesn’t even have a Planeswalker type! We hope to learn more about this mysterious figure – if she survives the events of War of the Spark. These new Planeswalkers will be joined by some of the most prominent characters from the last several years of Magic story, including Ajani, Teferi, and Vivien Reid. Even Tibalt’s here, looking stylish as ever! War of the Spark is Magic’s Infinity War: the long-anticipated conclusion to many separate stories, which will bring together dozens of characters whose paths may not have crossed previously. There will be a lot of characters and events to keep track of, so stick around – we’ll be breaking down the details for you over the next several weeks. If you’d like to preorder any of these Planeswalker cards, head over to CardKingdom.com now and see what we have in store!